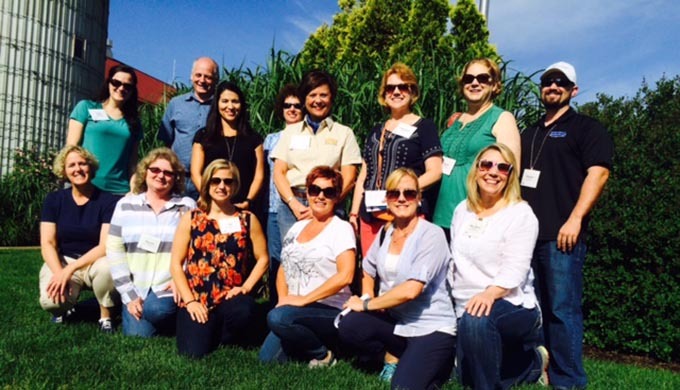 Above: SUDIA staff and partners attend the recent Honor the Harvest Summit at Fair Oaks Farms in Indiana. Saddle up while I tell you about a fascinating farm tour and educational experience at the recent “Honor the Harvest” Summit hosted by the National Dairy Council. Sustainability was the summit’s theme and it started by conserving energy use at our hotel. There was a power outage and as such, summit-goers enjoyed breakfast with wet hair by the light provided by cell phones. Many interesting facts did ‘come to light,’ in particular, emerging research on saturated fat. It turns out that saturated fat found in milk, cheese, yogurt and cream (although not butter, sadly) has no negative impact on cardiovascular health. This does not translate to “eat all the butter and cream you want,” but it does mean more dairy—including full-fat options—fits into a healthy diet. After a day of learning, we made our way to Fair Oaks Farms where we were immersed in the ways sustainability is applied to everything from input (cow chow) to output (cow manure). Did you know almost 20 percent of what dairy cows eat is unusable by people? Farmers partner with food companies to direct food waste such as Citrus peels and almond hulls into cattle feed versus landfills. What about all that ‘output’? It goes into an anaerobic digester, of course. This amazing piece of technology allows farms to take nutrients from manure and other food waste to create renewable energy, such as fuel and electricity—very impressive examples of sustainability. Good dairy cow care and comfort maintains a healthier herd, which equates to higher milk production. Examples were seen throughout the farm. The cows have fans and misters to keep them cool, as well as different bedding for extra comfort. There is also an emphasis on cleanliness—some barns are cleaned three times a day (I wish I could say the same for my house). If you can’t make it to a farm yourself for a lesson in sustainability, get to know a dairy farm family in your state while enjoying a nice cold, sustainable glass of milk. Kim Beavers is a registered dietitian for University Health Care System in Augusta, Georgia and is the co-host of the culinary nutrition segment Eating Well with Kim, which airs at noon Monday, Wednesday and Friday on WRDW News 12. 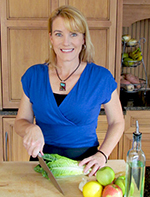 Follow Kim on Facebook for recipes and other tips.